The Central Headquarter of the Directorate is located at Hyderabad. For implementing the mandate of the Directorate, the geographic area of the country is divided into Seven Regions, each under the administrative control of a Regional Director who controls and executes the work through groups, sections and laboratories of that region. For special requirements regarding beach sand investigations in coastal tracts of the country, sectional office/ laboratory are established at Thiruvananthapuram and Visakhapatnam. The New Delhi office was set up during 1949 as the AMD headquarter,which was shifted to Hyderabad in 1974 and the office at New Delhi remained as the headquarter for Northern Region. Rajasthan was initially a part of the Northern Region, but during 1988 it was carved out to form a separate region as Northwestern Region (now Western Region). This Region was set up in 1956 in a rented accommodation at Patan Bhavan, Bangalore. AMD’s own office/ laboratories and residential quarters were established in 1986 in Nagarabhavi, Bangalore. Address : Regional Centre for Exploration and Research, AMD Complex, Khasmahal,P.O. : Tatanagar, Dist. East Singhbhum, Jharkhand - 831002. Eastern Region was set up during 1959 with headquarter at Kolkata. Subsequently the head quarter was shifted from Kolkata to Jamshedpur in its own premises during 1994. 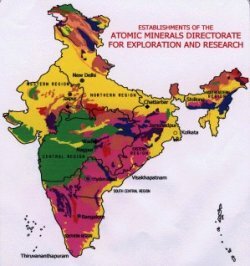 The major thrust of uranium exploration has been in the Singhbhum shear zone. The first uranium deposit of the country was established at Jaduguda in 1951. Subsequently, other uranium deposits like Bhatin, Narwapahar, Turamdih, Bagjata, Mohuldih, etc. were established. States : Arunachal Pradesh, Assam, Manipur, Meghalaya, Mizoram, Nagaland,and Tripura. Address : Regional Centre for Exploration and Research, AMD Complex, Nongmynsong,PO : Assam Rifles, Shillong – 793 011. Northeastern Region of AMD with Regional Headquarters at Shillong shoulders the responsibilities for the exploration of atomic minerals in the Northeastern part of the country. Exploration for atomic minerals in this part of the country began way back in the 1950's, initially, in Meghalaya and later extended to other states of Northeast India. Based on the outcome of exploration, AMD has concentrated its efforts mainly in the states of Meghalaya, Arunachal Pradesh and Assam, which have been identified as the most potential states. These states hold the potential for sandstone-type, hydrothermal vein-type and unconformity related uranium deposits, besides rare metal and rare earth deposits. The Region was set up initially as North Western Region during 1988 when it was carved out of Northern Region. It was housed in rented accommodations till recently and in 2004 a new office-laboratory building has been completed. The Region has residential quarters catering to the requirements of officers and staff. The Region was set up during 1958 as Western Region in a rented accommodation at Nagpur and divided during 1988 into Western Region-I with headquarter at Nagpur and Western Region-II with headquarter at Baroda (now Vadodara). With the closure of Western Region-II at Vadodara, the Region was subsequently named as Central Region and the office and laboratories were moved into AMD's own premises during 1994. The Region has residential quarters catering to the requirement of officers and staff. Cherlapally, Keesara Mandal, Hyderabad-500 083. The Region was carved out from Southern Region in 1988. Prior to it, all the investigations were carried out from Southern Region, Bangalore. The Office of the South Central Region was initially started in a rented building in Hyderabad and since 1993 it is located within the premises of AMD Headquarter, Hyderabad. In 2016, the Regional Office was shifted to the new campus at CHerlapally, Hyderabad.